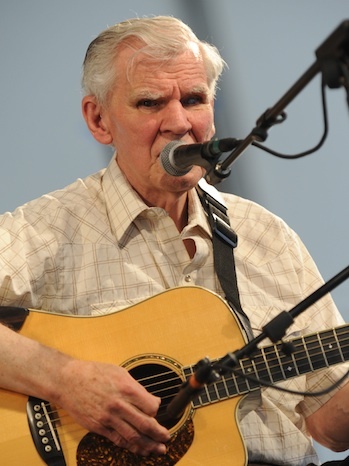 On May 29th, 2012, Arthel Lane "Doc" Watson passed away in a Winston-Salem hospital at the age of 89. Born in Deep Gap, NC, Doc's musical career spanned 7 decades and his contributions to American music will live forever. 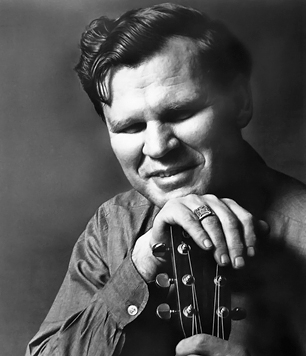 No doubt about it, Doc Watson will always be remembered as one of greatest guitar players of all time and recordings of his music will continue to delight and inspire others for eternity. Doc was raised in a musical family along with 8 brothers and sisters. His father worked at a sawmill, farmed and was a church choir director. His mother sang and Doc fell in love with music at a very young age. Blind from the age of 1, Doc started playing professionally in the early 50's and never stopped. It's hard to believe he never had a #1 record but he was award 8 Grammy's including a Lifetime Achievement Award in 2004. Though known throughout the world as an acoustic guitar player, Doc Watson actually started out on the harmonica, played banjo and electric guitar, and was also a songwriter who for a time made his living as a piano tuner. We can all thank Doc Watson for leaving us a wonderful catalog of studio recordings beginning in 1960. He recorded 38 studio albums, 15 live albums, contributed to 23 compilation albums and released 14 singles over his illustrious career, with his first solo recording as a signed artist being released in 1964. He recorded for many record labels, including Folkways, United Artists, Liberty, Flying Fish, Vanguard and Sugar Hill. In 1988 Doc was awarded the the National Heritage Fellowship by the National Endowment for the Arts. In 1997 Doc received the National Medal of the Arts from President Bill Clinton. In 2000 Doc was inducted into the International Bluegrass Music Association Hall of Honor and in 2010 he was inducted into the North Carolina Music Hall of Fame. Other awards include an honorary degree from Appalachian State University in Boone, NC and an honorary doctorate from the University of North Carolina at Asheville. Some labeled Doc's guitar playing bluegrass, many called him folk, others refer to his style as mountain music, lightning fast flat picking, a guitar wizard, guitar virtuoso, the descriptions go on and on and they're all right. If you research Doc's career you will find he also played blues, country, gospel, rockabilly, swing, and even studied classical and jazz music while attending the Governor Morehead School for the Blind in Raleigh, NC at the age of 10. I think it's safe to say that Doc Watson for all intent and purpose lived and breathed Americana music. In my research of Doc's incredible life and legacy I came across this quote from Doc, when asked how he'd like to be remembered. "Just a good ol' down-to-earth boy that didn't think he was perfect and that loved music. And I'd like to leave quite a few friends behind and I hope I will. Other than that, I don't want nobody putting me on a pedestal when I leave here. I'm just one of the people, just me." For many years Doc performed and recorded with his son Merle. Together they toured across the US and also throughout Europe, Canada, Japan, Mexico and South Africa. In 1985 at the age of 36, Merle lost his life in a tragic farm accident and in 1987, Doc co-founded the world famous annual acoustic music festival Merlefest in his honor. I was 19 years old and in the Navy the first time I had the thrill of hearing Doc's music for the first time at a bluegrass festival in Virginia. When his son Merle led him onto the stage I realized he was blind and when the two started playing, Doc blew me away both with his guitar and his voice. "Tennessee Stud" rang out over the crowd and I was on my feet clapping and hollering along with all the rest of the crowd. It was an incredible moment in my life I will never forget. Thank you so much Doc Watson and may you rest in peace.